bsk_4u2nv has no other items for sale. ALL GOODS WILL BE DISPATCHED IN PLAIN AND DISCREET PACKAGING BY FIRST CLASS MAIL. 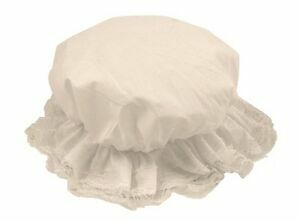 The mop cap looks absolutely lovely - design , material and price are all very good indeed. The problem is that mine, and my friend`s who bought one separately from me, are too small. We need them for a concert and are now still looking. Reading previous reviews was afraid it might be too small but as an adult female it fits just fine. Needed these mop hats for charity auction. Good value for money and stated on line. Just what we wanted excellent value. Looks really good. Bought 2 for school role play area, for Grandma from Little Red Riding Hood. Fantastic quality, great price and quick delivery. Thanks.